Quidditch players from prestigious universities are asking the National Collegiate Athletic Association to formally recognize their fictitious sport. 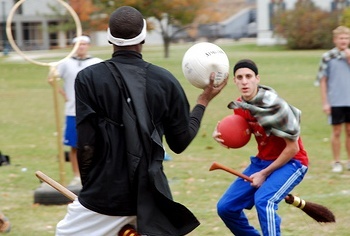 The fourth annual Quidditch World Cup is taking place this weekend, hosted by the International Quidditch Association. No, I'm not quoting children's literature here; this is actually going to happen. What's more, universities such as Duke, Harvard, Yale, and M.I.T are sending teams to compete--competition described by NPR as "trotting around on brooms while trying to whip a "quaffle" through a hoop." Even more unbelievable than a bunch of geniuses waddling around with cleaning implements clenched in their knees is that the players are looking for the NCAA to legitimize the activity. Valerie Fischman-- University of Maryland student and co-vice president of its quidditch team-- is spearheading the campaign, arguing that "I think that having NCAA status will give it a little more credibility and help keep it around a little bit longer." NPR notes that there are requirements to achieve this status, and they are by no means lax: "There must be official quidditch clubs at a minimum of 50 colleges across the country. Then, athletic directors from those colleges must individually petition the NCAA." I find it difficult to believe that athletic directors--whose careers are spent handling football, basketball, and baseball-- will take up the cape and broom on quidditch's behalf, but stranger things have happened. Thankfully, Alex Benepe, one of the founders of the real-life version of quidditch, thinks the NCAA campaign may be a mistake, saying "NCAA sports at colleges are superintense." That they are, my friend. Then again, no current collegiate sport is intense enough to include capes or imagined flight.